After beginning his working life as a printer's apprentice, Louis Crucius (or Crusius) completed the necessary requirements to graduate as a pharmacist in 1882 and a doctor in 1890 in St Louis, Missouri. 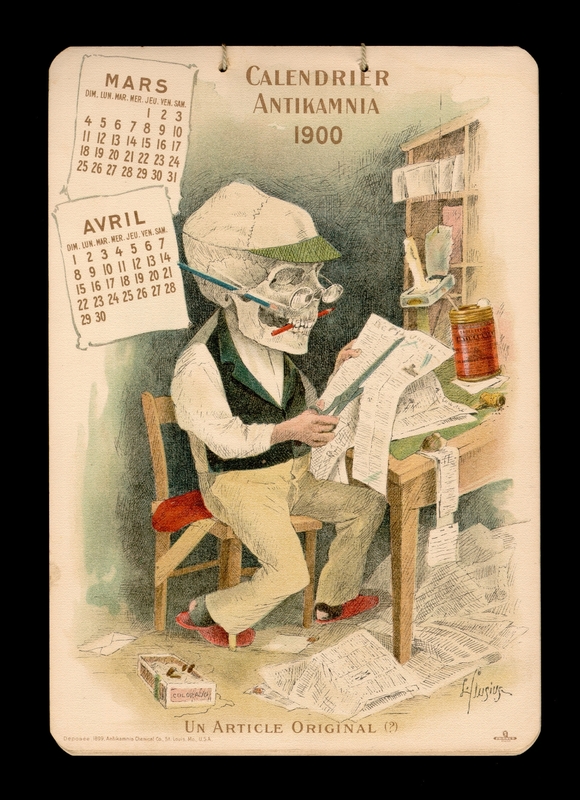 While he was studying he worked in a pharmacy and made humorous sketches that were placed in the window of the store. 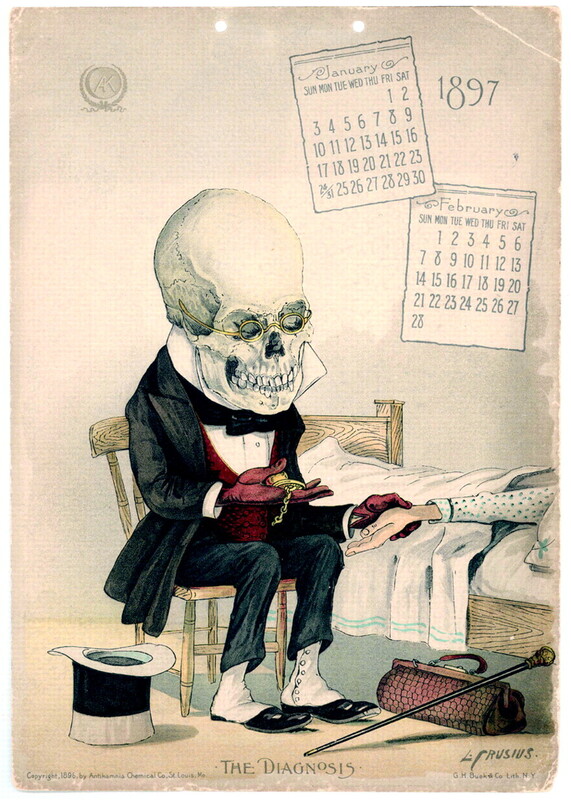 A collection of these drawings was published in 1893 ('Funny Bones'). He lectured in histology and anatomy and eventually came to be a Professor of Anatomy but died in 1898 from kidney tumours. 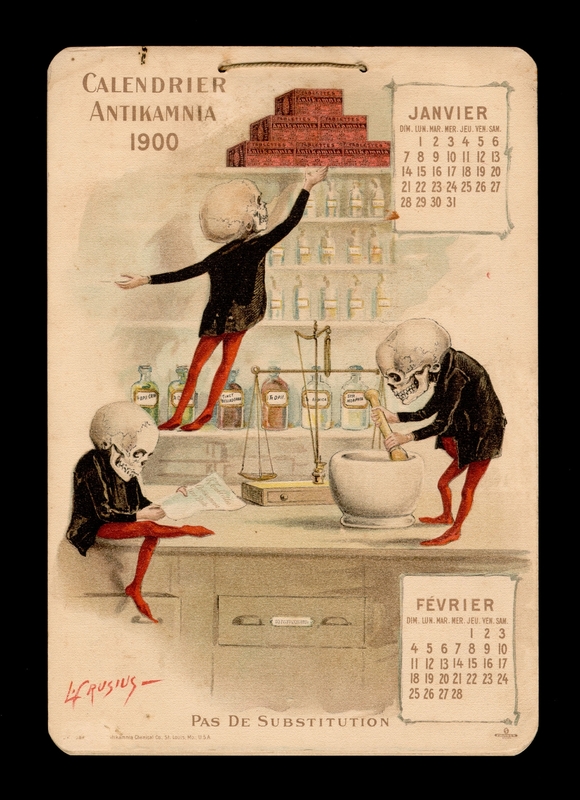 Although he gave most of his drawings away, Crucius sold a number of them to the Antikamnia ('opposed to pain') Chemical Company which had been established in St Louis in 1890. 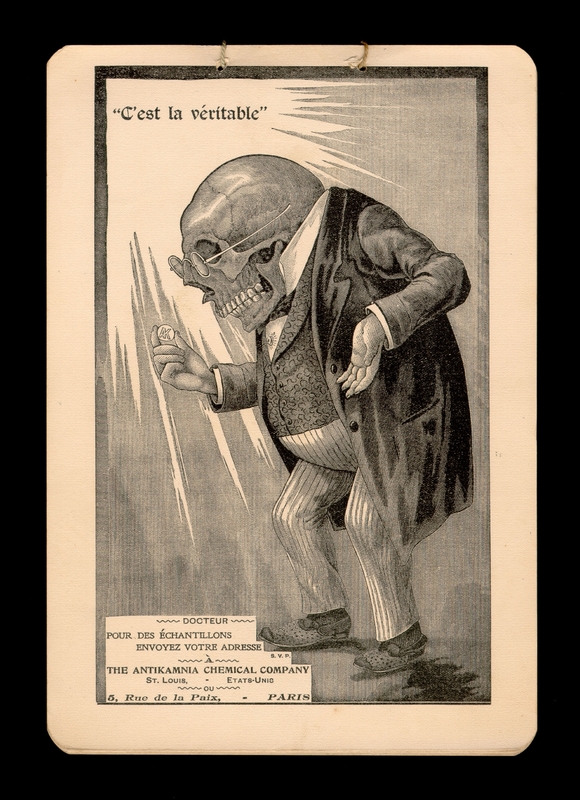 They produced antikamnia medicines containing the coal tar derivative, acetanilid, an anti-fever drug with pain relieving properties somewhat related to paracetamol, but which would be later shown to be a toxic compound not to mention addictive. Antikamnia was mixed with substances like codeine and quinine to enhance the pain relieving effects. 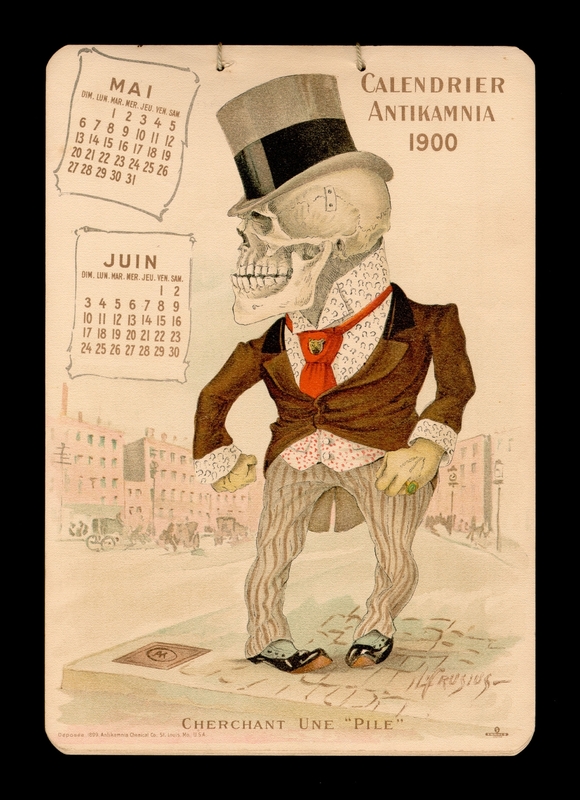 30 of the Crucius 'dance of death'-inspired drawings were used to make 5 years worth of Antikamnia Chemical Company calendars - between 1897 and 1901. 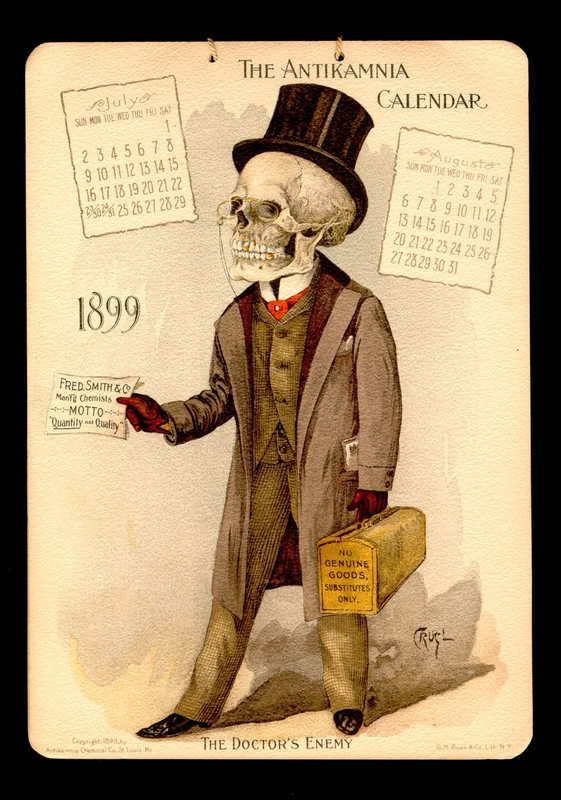 They had a fairly aggressive marketing campaign in which the calendars (aimed at the medical fraternity) as well as postcards and sample packs were distributed to doctors in the United States and overseas. The American Journal of Roentgenology AJR:182, 1984: 'Medicine in American Art: The Diagnosis' by Stefan Schatzki. This is a short article and source for the Jan/Feb 1897 image. 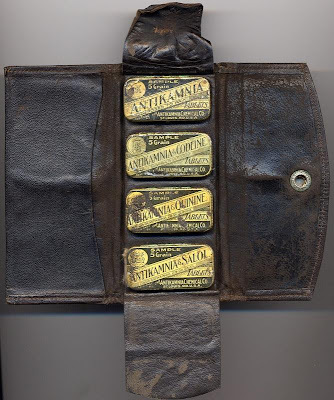 Physician's Antikamnia Sample Pocket Kit c1900 image source. The revenue stamp image comes from here, which has a little more information about the company. 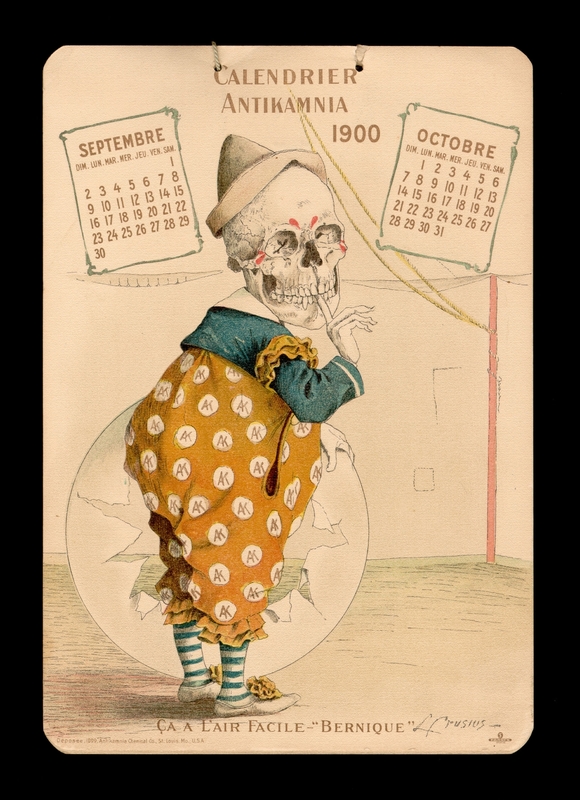 Sept/Oct 1897 calendar image source. 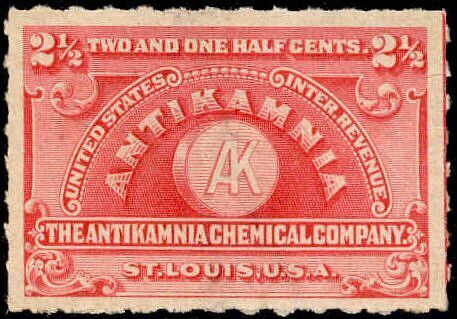 The Antikamnia Chemical Company were eventually prosecuted for failing to disclose the source of the active ingredient on their packaging: U. S. v. ANTIKAMNIA CHEMICAL CO., 231 U.S. 654 (1914). 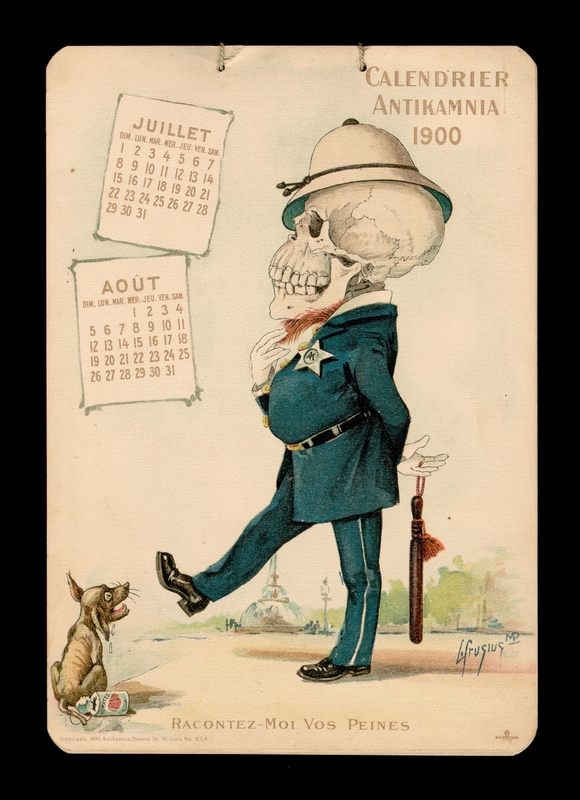 Update: Ok, I got a bit confused - UCLA have both full 1899 and 1900 calendars. They are usually sold off as single pages so a complete calendar is very rare. I'd just like to say this blog is BRILLIANT, and I found you through Scribal Terror (Gail). Beautiful stuff! Thanks for making such a great blog, I really love it. By the way, sorry for asking lame questions but... I'm trying to find the RSS link, to add it to my netvibes page, but I can't find it. Can someone help me, please?, thanks. Cheers. I neglected to mention how I found this. Someone emailed from a venerable nameless institution and I googled their name. And then I hit 'images'. 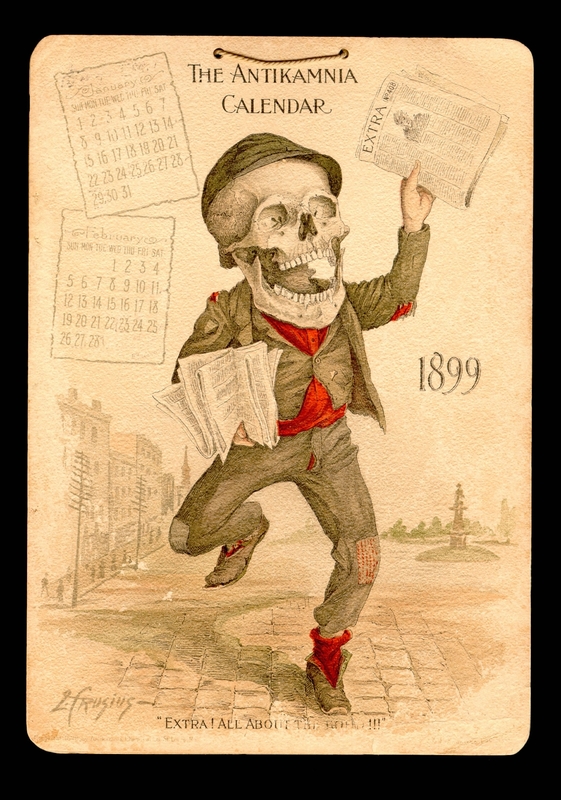 One of these twisted little memento mori illustrations was staring back at me. How could I not take it home with me? Hans, you'd be looking for this..
pk, thank you very much! These were so weird that even my mother (who does not really go for weird things) was intrigued. pk, I have tagged you with the Thinking Blogger award. Hopefully there'll be a badge to follow. your site has blown my mind for a year now. Thank you. Great, excellent, etc. Congrats on BoingBoing mention! hey, where do you find these images? very interesting! I have been logging on to BibliOdyssey for some time now, and I have to tell you, peacay, what a pleasure it is to drop in. It's like having a magic curio shop/gallery on the corner. You never know what you'll find. PS I've posted some scans from one of Lynd Ward's "novels in woodcuts" at my site Hokum in a sort of homage (to Ward and to BibliOdyssey!) Snag 'em if you like. On second thought, I seem to remember a recent ad campaign from an outdoor sports company using skeletons in the wild wearing their indestructible gear, e.g. disgorged from a shark or left on the slopes of a mountain. I love your blog! Do you mind if I link you? I think your pretentious hat really goes with your eyes. Narnia, people playing along at home will find your 2nd comment a bit odd. Heh. The wonders of crossposting. My eyes are actually on the internet. As is one of my hats. But a link would require a personal (as opposed to public) request. 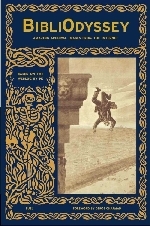 "Angela sends a link to some EXCELLENT morbid artwork from the turn-of-the-century. I'd KILL for an original of one of these - wouldn't you?" Wow, thanks for sharing these. 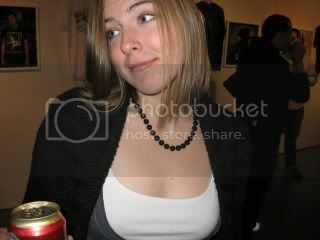 I've made a post linking to yours, just so you know. I'm researching "death" as it is used in advertising. Does anyone know of any such use besides The Antikamnia Chemical Company? Ratna, my initial thoughts would be to find an encylopedia of advertising and also to contact some sort of funeral society/agency/organisation. I think otherwise you could cruise advertising history websites because the symbol of death - eg. 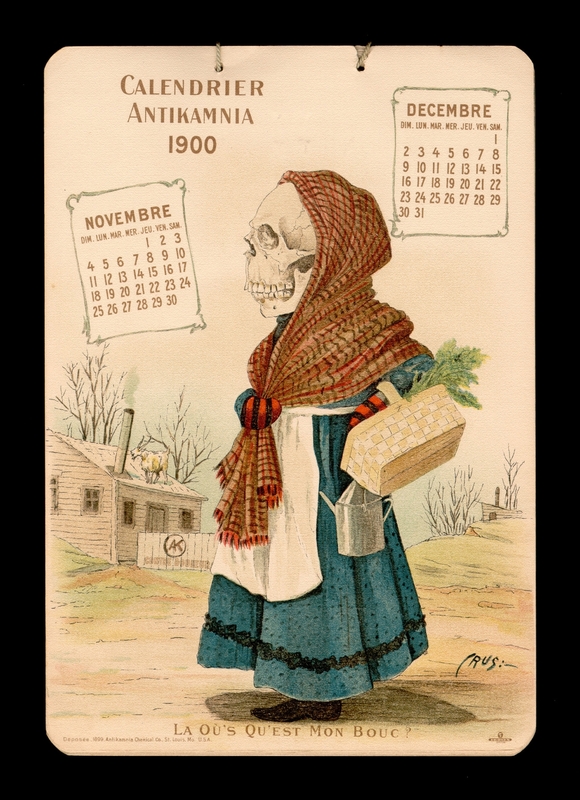 grim reaper - has been used extensively, particularly in the 20th century such as for AIDS campaigns and the like (but of course goes way back). For some of these repositories you could check here under publications but that would by no means be comprehensive. I guess I'd also try a bunch of search strings at somewhere like NYPL. Fascinating from the perspective of an archivist. Washington University in St. Louis Department of Special Collections did an exhibit last year for Halloween with all sorts of creepy woodcuts, lithographs, books, and more. Wish we'd had some of these in our collection, especially with the St. Louis connection. They would have fit perfect!